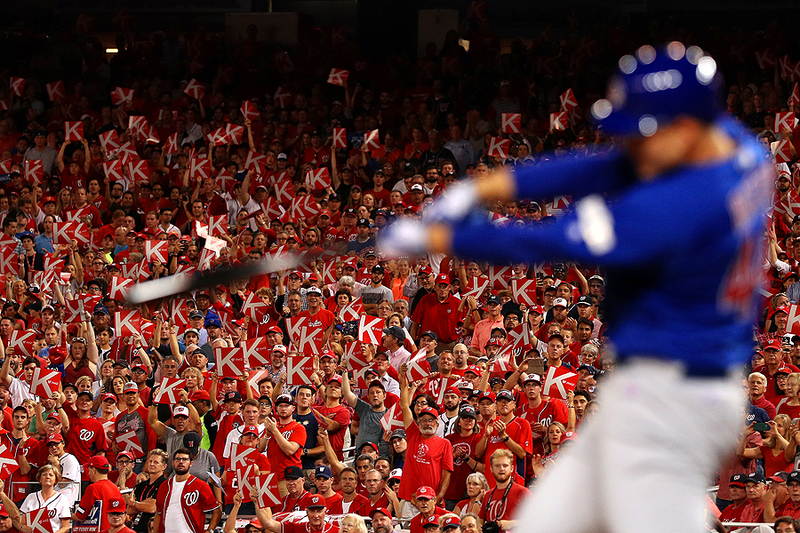 "Fans react with 'K' strikeout signs as Anthony Rizzo #44 of the Chicago Cubs swings during the fourth inning against the Washington Nationals in game one of the National League Division Series at Nationals Park on October 6, 2017 in Washington, DC." The town of Washington, DC is said to have a 'curse' in advancing and winning in the playoffs - no matter what the sport. The last time a DC sports team were champions was in 1992 - being the Washington Redskins winning Super Bowl XXVI. Since then there has been a lot of heartbreak for sports fans. Unfortunately, nothing changed this year as Nationals struck out, literally, during a full count in the bottom of the ninth inning to lose during game five of the National League Division Series. Being unbiased, I do know when one of the teams in the district does win, it's going to resemble the Cubs finally winning the World Series.